to ship a 20ft container from one country to another. We’ll give you an idea of shipping rates from around the world and explain how these costs are calculated. International container shipping rates can sometimes be a pretty complex business, but we’ve got you covered. This guide will tell you everything you need to know about moving your belongings overseas. 02 | How are container shipping costs calculated? 03 | Which size shipping container do I need? 05 | Sea freight or air freight? 08 | Do I need container shipping insurance? 09 | How much does a shipping container cost? To start collecting quotes now, simply fill in the form at the top of this page. Our suppliers will get back to you with their best prices and they can help you with all of your queries. , which is the typical value of the contents of a three-bedroom house (according to Admiral Insurance). These prices were last updated in October 2018. Take a look at the tables below to get an idea of how much your international move is going to cost. Please note: these container shipping costs exclude typical add-ons such as door-to-door delivery, professional packing/unpacking and basic insurance cover. Our shipping suppliers normally incorporate these services into their prices, so expect some discrepancy between the rates given here and the quotes you receive. These estimates should be used as an indication only. Wondering which size container you’ll need? You’ll find our detailed guide to 20ft and 40ft containers further down the page. We bet you can barely contain your excitement. How are container shipping costs calculated? It’s not officially one or the other because it depends on what type of shipping you’re using. When it comes to sea freight, the dimensions of your goods are the most important, while air freight cares more about the weight of your goods. The more goods you have, the more it will cost to ship them to your new home. Will your goods be flying or sailing? The mode of transport will determine both the price and the time it takes for your belongings to arrive. 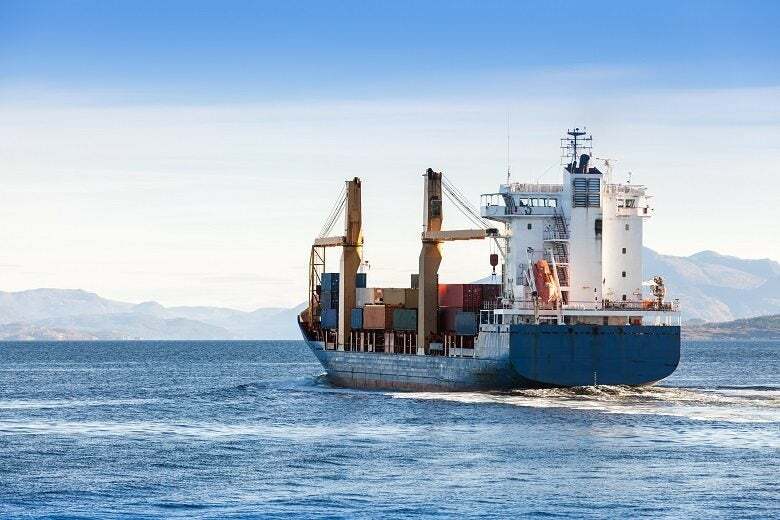 Air freight tends to be the quicker and more costly alternative to sea freight, so if you’ve got time to spare then you should definitely opt for the ocean. Sea freight is usually around five times cheaper than air freight. This one is pretty self-explanatory. If you’re shipping your stuff halfway across the world then it’s going to cost more than a short trip across the Mediterranean. Whether your move is port-to-port or door-to-door will also affect costs; if your shipping company is going to transport your goods all the way from your old front door to your brand new one then this will bump up the price. Despite this, we thoroughly recommend door-to-door services as they can prevent logistical headaches. Customs duties and service charges are unavoidable but they will vary from country to country. Naturally, the arrival destination of your goods will determine how much you have to pay in the way of customs and taxes. Check out our breakdown of these various charges near the end of the page. International shipping has peak seasons, just like any other industry. These generally occur in the summer (between August and September) and just after the Chinese New Year (between January and February). During peak season, demand is greater, prices are higher and capacity is more limited. It’s best to avoid shipping at these times if you want the lowest prices. Which size shipping container do I need? How big is a 20ft container? We’ve also made a nice infographic to show you exactly what can fit inside a 20-foot shipping container. If you’re lucky enough to own five bikes then it turns out you can bring all of them. How big is a 40ft container? A 40-foot container will give you double the amount of space as a 20-foot container, but it doesn’t come at twice the price. 40-foot containers are definitely better value for money if you have a lot of stuff to bring. Houses with four (or more) bedrooms will most likely need a 40-foot container, unless you have one of those trendy minimalist homes that doesn’t have much furniture. Can’t leave your trusty four-wheels behind? When it comes to shipping a car, the 20-foot container is big enough but it won’t leave a lot of room for other cargo. Therefore, if you want to bring your car along with the contents of your household then you’ll most likely need a 40-foot container. Here’s our guide to shipping cars. Once you’ve chosen a container, you’ll need to pack all of your belongings. Check out our super handy guide to moving furniture abroad. Depending on the volume of goods you want to ship, you may not need to pay for the use of a whole container. Shipping companies have devised a system for people with smaller amounts of cargo where several customers can share the space of a single container. This is called a ‘Less Than Container Load’ (LCL) or a part-load shipment. Typically, people who are moving the contents of a one-bedroom flat can opt for LCL, but volumes greater than that will usually require a whole container. This is called a ‘Full Container Load’ (FCL) or sole-use shipment. It’s a bit like the difference between a private taxi and a bus. Why choose Full Container Load? It’s better value. In terms of cost per cubic metre, you get more bang for your buck with an FCL. The shipping company will charge you a flat rate for the use of the container rather than making you pay for the specific volume of your goods. It’s faster. When you’re sharing a container with other people’s cargo, there’s more waiting involved. Belongings have to be loaded and unloaded at each port and then placed on separate trucks. However, an FCL shipment doesn’t need to be opened until it’s at your new house. The extra time required by LCL can vary, ranging from 4-5 days to a couple of weeks. It all depends on where you’re going and the company you’re shipping with. Your goods are safer. With all the extra handling, LCL comes with an increased risk. The loading and unloading that happens at each port means that LCL shipments are moved around more often than FCL shipments. Naturally, this puts your belongings at greater risk of being damaged. FCL is much more advisable if you have fragile goods to bring with you. You can ship a car. If you’re sharing the use of a container with other people, transporting a car is too risky. Cars are very safely secured in shipping containers but they are big and heavy things, meaning there is always the potential for damaging other people’s cargo. FCL is the solution here. Why choose Less Than Container Load? It’s the cheapest way to ship small volumes. If you don’t actually have that much stuff to bring with you, it would be silly to hire a whole container. Everything will just rattle around once it starts moving. LCL is the most cost-effective method for smaller moves and it’s quite common that someone will have only a couple of boxes to bring. Students who are travelling abroad just for a year or so regularly opt for LCL. However, there is a point where you should switch from LCL to FCL, even if you don’t have enough to fill a container. Shipping companies advise that any shipment over 15 cbm should be sent by FCL, as this is actually more economical. 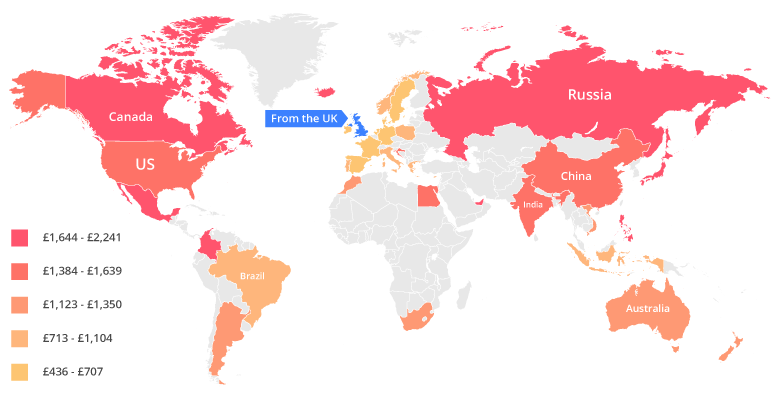 Choice of transport is another big factor when it comes to international shipping costs. It’s all about balancing your priorities. What’s more important to you, getting your things shipped as quickly as possible or keeping costs down? Moving your belongings by sea and by air are the two most popular options for international moves.
. See our price comparison table below for more details. Container ships are the most eco-friendly option. In contrast to air or road transport, ships on the ocean release the lowest amount of carbon emissions. “Sending a container from Shanghai to Le Havre (France) emits fewer greenhouse gases than the truck that takes the container on to Lyon” (Rose George, Ninety Percent of Everything). Cargo planes are faster. If you’re in a hurry to ship your belongings, transporting them by air is the fastest method of shipping. Between any two global destinations, it will usually take about 1 to 3 days. Compare this with a container ship’s journey from the UK to Australia, which takes on average 32 days. The ocean is a big place and a ship full of thousands of steel containers can only go so fast (about 23 mph). We’ve made another table to give you a better idea of the difference between air freight and sea freight costs. These prices are calculated for some of our most popular routes from the UK (the Port of London / Gatwick Airport) and have been sourced from WorldFreightRates.com. , and they were last updated in October 2018. Truck freight or train freight? If your international move doesn’t involve crossing any oceans, then sea freight isn’t an option. Of course, you can still transport your belongings by air, but your cheapest solution for a land move is by truck and train. Even a move from the UK to Europe will most likely not need a container ship, as trucks can take the ferry. Trucks are more flexible. We’re not referring to those articulated lorries that can bend round tight corners. Transporting your belongings by road means that they can be delivered right to your door without loading and unloading along the way. Unless you’re moving to a house next to a train station, opting for rail means that your goods will have to be transferred to a truck before they can reach you. What’s more, a truck’s time schedule is much less restricted than that of a train. Rail is more economical and more ecological. Double whammy! Trains are the container ships of the land, offering a cheaper and greener alternative to trucks. They are also more reliable when it comes to reaching their destination on time, as they are not subjected to the traffic problems and bad weather that can blight road travel. Old, dependable locomotives! It doesn’t stop there. Once you know the volume and/or weight of your goods, the container size, whether it’s an FCL or LCL shipment and what kind of transport you’ll be using, there are still a few additional shipping costs that you need to think about. These are: customs duties, container inspection fees, General Rate Increase (GRI), inland delivery charges, quarantine fees, and insurance cover. You can’t do much about customs duties. Your destination country will tax your cargo whether you like it or not, along with fees such as port service charges and terminal handling charges. However, these will vary from port to port so you should speak to your shipping company beforehand about what to expect. Our key piece of advice is to declare everything you’re bringing into the country and don’t take anything that isn’t allowed. With the technological advance of electronic scanning machines, it’s unlikely that your container will be physically inspected. In the USA, just 5% of inbound containers receive physical inspection, and it’s even less common in European ports. However, if the scans give customs staff any reason to be suspicious then your container will most likely be opened and investigated. In this scenario, shipping companies will usually ask you to cover all the charges incurred by this process. A General Rate Increase (GRI) is the average rise in base shipping rates implemented by shipping companies. They are designed to cover the continually increasing costs faced by freight carriers and they occur very regularly (sometimes once a month). A continual cycle occurs: shipping companies implement GRIs, demand falls, they lower their prices, demand rises and another GRI is implemented. This is what makes container shipping prices so volatile. Consequently, once your Cargo Ready Date (CRD) has been agreed with your shipping company, be sure to check whether it falls before or after a new GRI as this can make a significant difference to the price. You need to make sure that your shipping company is clear with you about what service they are providing. They might only be offering you a port-to-port rate, which means they’ll deliver your container to its destination port and then you’ll have to deal with it after that. This can often be more costly than opting for a full door-to-door service and it’s a bunch of logistics that you probably don’t want to deal with. Be kind to yourself and make sure your container is being taken all the way to your new home. Quarantine fees sound like a thing reserved solely for animals, but this is not the case in some countries. In Australia, for example, people there are worried about foreign pests (eg. insects or bacteria) disrupting their ecosystem. Officials will inspect all items coming into the country, looking for unclean pieces of furniture and outdoor equipment. This inspection comes with a fee, along with further charges if they find something that shouldn’t be coming in. It’s important that you know about any quarantine process before you start packing your belongings, so speak to your shipping company. Do I need container shipping insurance? In short: yes. International shipping isn’t always smooth sailing, so insuring your cargo is a no-brainer. And it won’t cost you too much either. Shipping insurance is based on the monetary value of your belongings, rather than their weight or volume. So to insure cargo worth £40,000 ($55,000) travelling from the UK to Australia, it would only cost around £700 ($900). International shipping has become increasingly safe, however, so you shouldn’t worry too much about your possessions getting lost or damaged. Here are just some of the ways the international shipping industry has made moving abroad that bit more secure. This fancy term basically means the use of several different types of transport. By using steel containers with standardised, universal measurements, the global shipping industry has found a way to move cargo seamlessly between sea transport and land transport without having to unload each time. The same container can travel by ship, train and truck all the way to your new house. Handling of goods is less frequent which means damages are far less likely. There are 50,000 merchant ships in the world fleet and they have all embraced intermodal transportation. Most international container ships can hold over 10,000 20ft containers with the world’s largest container ship carrying up to 18,000 – the mighty Maersk Triple-E. To put that into context, the biggest container ship in 1956 could hold only 800 containers. With all the steel boxes on board these modern vessels, it’s vital that they are all accounted for. Most shipping companies use ISO codes (a 4-character ID) to track every container electronically. The International Maritime Organisation (IMO) regulates all global shipping. The sea can be a dangerous place so it is vital that the IMO hold all container ships to rigorous standards. So, although international shipping is safe, it doesn’t mean that accidents don’t happen. Getting shipping insurance is a sensible option and shipping companies strongly advise it. You can check out our specific guide to international removals insurance. It isn’t necessary to buy your own shipping container (our suppliers will provide one for you), however some people decide that they can get multiple uses out of one. A shipping container is not just for shipping; once its career on the sea is over, a container can be anything it wants to be. Arty people have transformed these big steel boxes into mini homes, trendy offices, garden sheds, swimming pools and pop-up cafes. The only limit is your imagination. The average cost of a new or barely used (i.e. one-trip) 20ft container is around £2000. Once you start looking at second-hand containers, the price will fall to around £1500 or below. If you’re looking to go supersize and get a 40ft container, these cost around £3000 brand new or barely used, while second-hand containers are about £2000. So how long will a shipping container last? Well, a container that spends its whole life on the ocean will be useful for about 10-12 years, but let it rest and its lifespan will grow to 25-30 years. Containers are windproof and watertight, but sadly they are not immune to rust. Here are the answers to some of our most popular shipping queries. 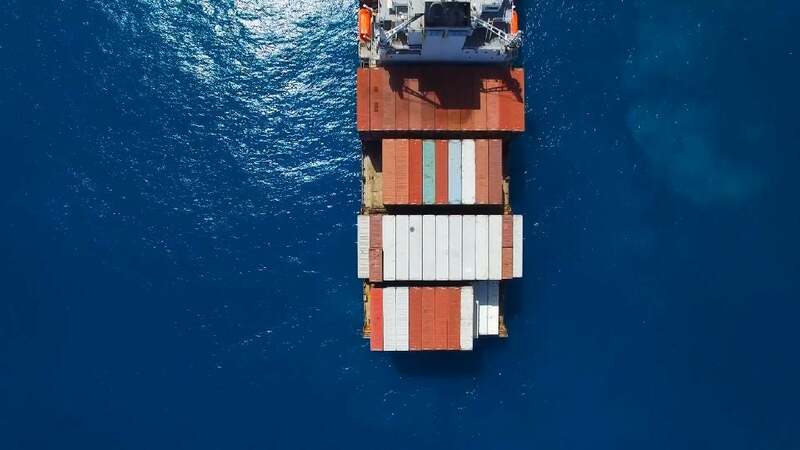 There are five key factors that shipping companies use to calculate their costs: 1) the volume or weight of the goods, 2) the type of transport, 3) the journey distance, 4) the destination port, and 5) the time of year. Our suppliers can explain their calculations to you in more detail. Should I use air freight or sea freight? Your choice between air freight and sea freight largely depends on your budget and your time. Air freight is quick, with most journeys taking between 1-3 days, but it’s also very expensive. Meanwhile, sea freight is much slower, but it’s also around five times cheaper than air freight. How much does a shipping container cost to ship? Generally speaking, it will cost somewhere between £1,000 and £2,000 to ship a 20ft container overseas, although this figure can vary quite significantly. For example, it depends on how far you’re moving and how much you’re bringing, as well as insurance costs, professional packing fees and customs charges. A 20ft container contains 33 cubic metres of space, and it can usually transport the contents of a three-bedroom house. A 40ft container has more than double the amount of space – 67 cubic metres – and it is useful for whole-house moves of four or more bedrooms. If you’re buying a 20ft container that is new or has only been used once, it will cost about £2000, while second-hand containers should cost less than £1500. A 40ft container costs around £3000 if new and around £2000 if second-hand. Hopefully we’ve made international shipping costs a little easier to navigate. There is a long list of factors and considerations but nothing that MoveHub or your shipping company can’t help you with. The next step is to find your best price. There’s an easy way to do this: simply fill in the form at the top of this page and up to 6 suppliers will get back to you with their quotes. If you’re having to choose between several shipping companies, we go through 2019’s best shipping companies here. Best of luck with your move! How far does the average container ship travel in one year? It travels the same distance as a journey to the moon – and halfway back! Charlie is a Yorkshire-born writer with a love for travel, animals and sea containers. He currently lives in London with no pets.